Dips and Sauces by Aditi serves deliciously handmade dips made from natural ingredients. Following the maxim of ‘you are what you eat’, Aditi ensures that while the condiments are completely free from harmful chemicals and preservatives, there is no compromise on the flavour and creativity. Finger foods and dips are a match made in heaven. Whether you're preparing for a movie marathon at home with your squad or a kid’s birthday party, dips are instant crowd-pleasers. Aditi offers some of the most popular dips (with her creative tweaks, of course) to go with your favourite finger food. Check out the menu and you would want to try them all. For something rich, creamy, and spicy, try out their Cheese Jalapeno Dip or the French Onion Dip, with the tanginess of onions. Not a fan of creamy dips? 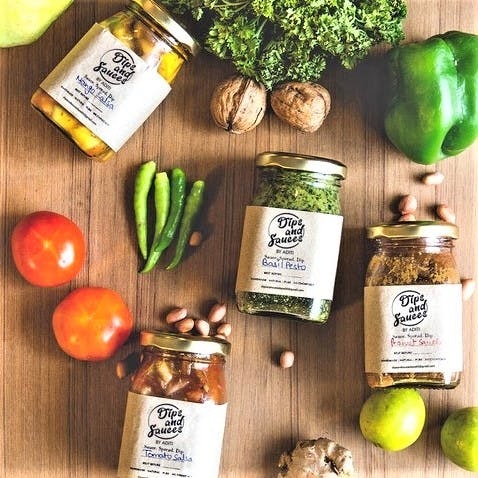 Try the knockout Mango Jalapeno Salsa or the flavor-packed Aglio Olio Sauce or the interesting Olive Tapenade (made of exotic olives with capers and sundried tomatoes). We are completely digging the Pineapple Sweet Chilli Dip, a creative combination of pineapple, garlic and chilli, that left us wanting for more. So, go ahead and dabble in some serious dip action from Dips and Sauces while you experiment with different finger food and dip combos. Dips and Sauces is only a few months old and Aditi is definitely looking forward to growing this baby of hers. That said, we would love to have a lot more options on the menu to choose from. Since her products are homemade and preservatives free, these come with a shelf life of not more than 3 - 6 months. Be sure to refrigerate and consume the dips within that time.